Who says young people only want to party? Well they do, but sometimes it's for a good cause, as is the case with an event this weekend. 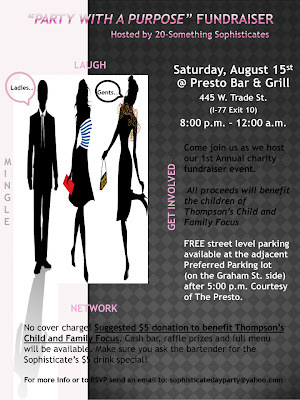 The 20-Something Sophisticates, a Charlotte-based women's social group, is hosting a "Party with a Purpose" on Saturday (August 15), 8 p.m. to midnight at Presto Grill (445 W. Trade St.). The ladies are asking for a minimum $5 donation to attend and all proceeds will benefit Thompson's Child and Family Focus, an organization that provides services in treatment, education, and care for children who are at risk for social and academic failure. The money raised will come at a great time since school is starting back soon. At the event, there will be door prizes raffled away and the first 20 ladies will receive complimentary gift bags. Fellas: Based on my experiences with this type of event, because it is thrown by women that is what the majority will be. So make sure you don't miss out. For more info, click here for the Facebook link.